shuffled back into his deck? play it must be placed in the discard pile. passive from being able to resolve. Both Repo Man and Stygian eye have a condition which while met create an effect. For Repo Man it is "If you win a Combat struggle at a story that Repo Man is committed…" and Stygian Eye is "Attach to a non-Ancient One character…" While both of those conditions are true the following part of the card is in effect. Since you cannot lose the combat struggle already won, control of that card cannot "end" it can only have a new take control effect exerted on it or leave play in which case it reverts back to its owner's out of play area. 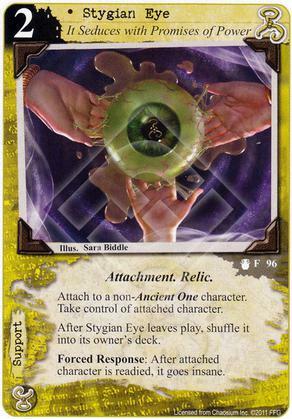 Stygian Eye however can be unattached from the attached card which would end its following effect, giving you control of the card. Bottom line, control lasts only so long as the attachment is in play. Also, not that characters immune to insane will be in control indefinitely, barring other circumstances. This will likely be clarified in an upcoming revision of the FAQ. just a question. since im building this MU Hastur Lunaticdeck... can you atteach this card to an own character? For example I have the Arkham Asylum and a Student Archaelogist in play, atteach this to the student and ready the student. Now she goes insane. You pay one for the Asylum to restore and ready her. What comes to my mind is, since she is restore and THEN readied her effect should take place first. But since its just a response while the eye has an forced responce (which triggers when the character is readied so kind of thereafter) Im not sure about this. Becouse if you can instant restore trigger effect ready drive her insane you could basicly for every domain you have undrained let the opponent discard one card. But it all is only possible if the timing is right so I would like to have this clarified befor trying to build a deck around a non-existing combo. Keep in mind you can have only one unique in play, if you play on your own guy you wont be able to steal character with another copy while this one is in play. Seems like I overread those three lines of FAQ... and since i dont know of another card which make my own one go insane without too much trouble... yeah my combo is non-existant. But the one with Charles Dexter Ward (KD) really is a nice one. If I attach Stygian Eye to an opponent's Unique Character and take control of it; my opponent then plays another copy of the Unique Character ; and the Stygian Eye attached to my copy of the character is then destroyed, do I retain control of (my copy of) the character because the Opponent cannot take control of another copy of a Unique character he already controls? Or does one copy have to leave play and if so which? You ask a fine question. I pondered on likely resolutions for a while without firm answer before I resorted to some research and found this tangetially intended comment in the FAQ: "The limit on unique cards still applies. You cannot gain control of or play a unique card if you already control or own a copy of that card in play." So, it turns out your opponent wasn't allowed to play his copy to begin with. This is consistent with, but not trivially inferred from the original rules: "If a player has a copy of a unique card in play, he cannot play, take control of, or put into play another copy of that card." In hingsight this was no surprise, I recall irritation at the Archmage Attache at it allow my opponent to play my unique, thus preventing me from doing so. Sadly for you, the limited rules on the topic suggest we can't maintain the illegal state (boh copies in play) and they don't encourage unwinding except when it is reasonably easy. My guess is that a typical tournament director would note the illegality of the second owned unique and require it be removed from play thus allowing the first copy to return to the owner's control. The only question is what would happen to the original. If it had entered play recently I would return it to the owner's hand - deeming knowledge loss a sufficient penalty but if it had been around long enough to be useful I may well consign it to the graveyard, subject ot the non-owner's preference. Thanks. Not playing the second copy makes sense. Stygian Eye is itself ubique so this means if my opponet steals one of mine (eg with Burglar Tools) , I can't play another Eye.